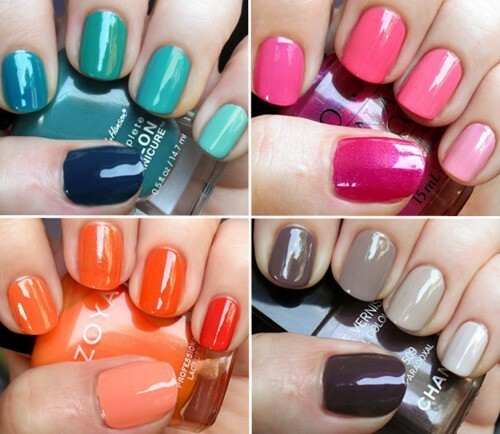 Come summertime, your nails are your greatest accessory. Hands are out of gloves, toes are exposed… whether you like it or not, all nails are on display. 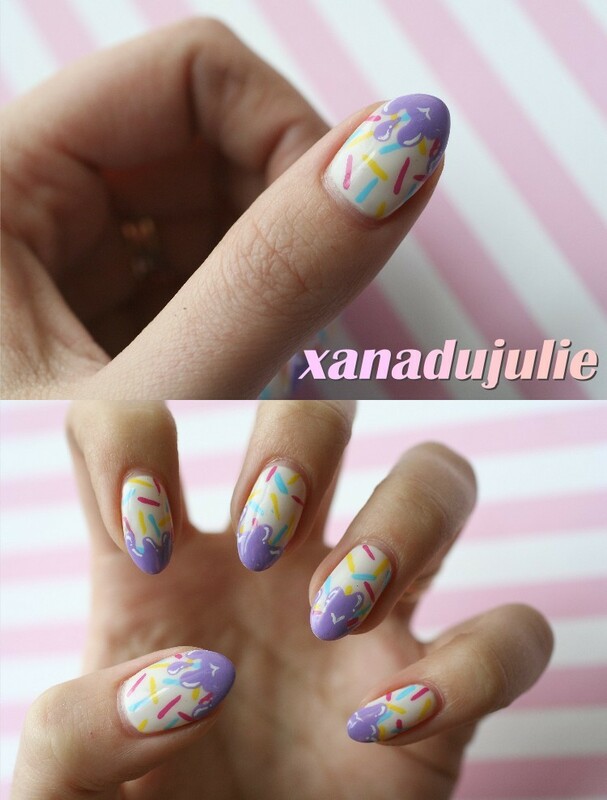 Today, we present a few ways we will be having fun with our nails this summer. Neons are showing up everywhere and we love a bright neon pink or orange, especially on toes. Our recs? 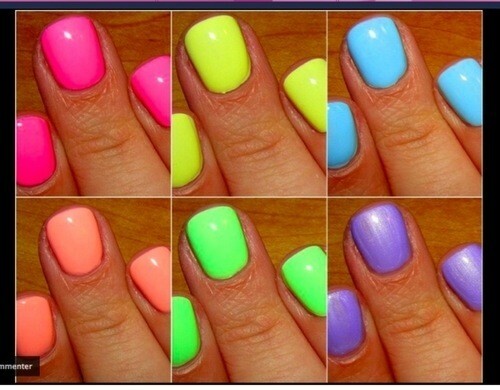 Summer Pink by Pixi Beauty, Neon Red by American Apparel, Glowstick by Orly and Orange You Hot? by China Glaze. We’re intrigued by these texturized manicures involving tiny microbeads stuck to the nail. Not really appropriate for a regular day at the office (no one wants to be blamed for a floor covered in beads), this would be fun for a wedding or bachelorette party this summer. 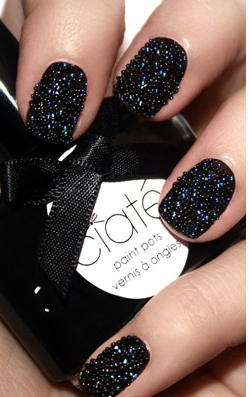 Ciate offers a caviar manicure kit for $25 from Sephora, or you can invest in a thick topcoat and package of microbeads (also called bullion beads) from a craft store for less than $10. 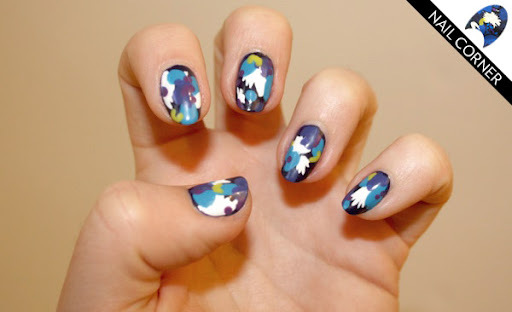 An Erdem-inspired manicure from FASHION Magazine. complex manicures that look more like miniature works of art than nail designs. Nail Bar in Toronto is especially good for creative, out-of-the-box manis. Regular nail polish doesn’t get this shiny. Image source. for significantly less and easily do it yourself. A design for every occasion! effect. You can get them at most drugstores, or at Winners, where they’re usually discounted by a few dollars. 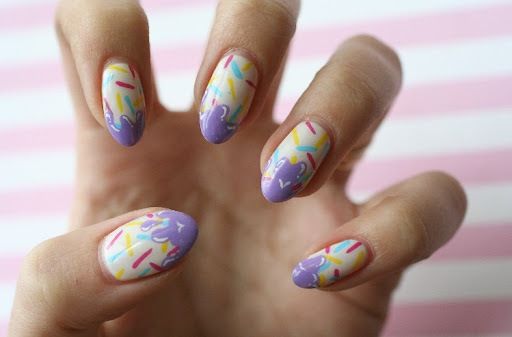 It was only a matter of time before the ombre trend moved from hair and clothing to nails. We’ve seen it done two ways: one nail with gradients of colour (like above), or gradients of colour going across all five nails (below). A great look for any girl who’s looked at her nail polish collection and realized she bought almost the exact same colour five times. Only skill needed to create this look is excessive nail polish purchasing. We ladies on the fourth floor have a bit of an office-wide obsession with nail polish. 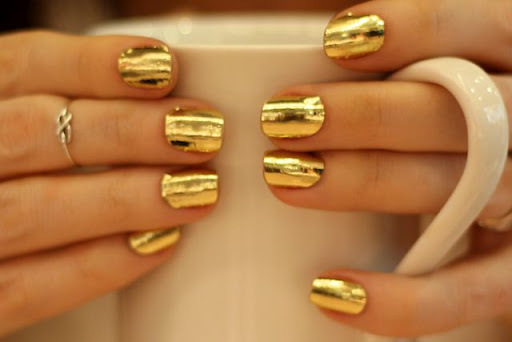 Many lunchtime conversations are dominated by talk of our new favourite shades or nail art. Needless to say, we are thrilled to see articles on nail trends popping up in Toronto Life and T Magazine. We could wax rhapsodic about our current favourite colour (it’s Deborah Lippmann’s Yellow Brick Road, in case you were wondering), but instead we thought we’d share some nail designs we’ve been itching to try out this summer. Are you sick of the royal wedding yet? We aren’t. Especially after seeing Paige’s incredible Duchess Catherine-inspired manicure. 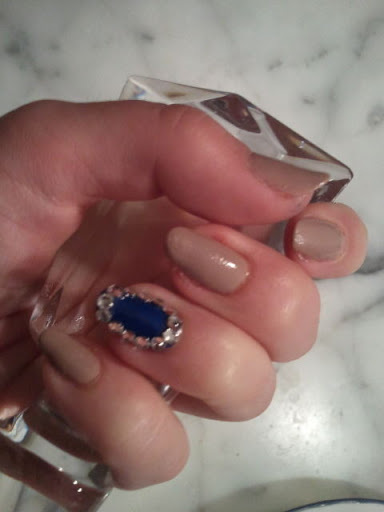 The blue polish is OPI‘s Dating a Royal and the crystals are by Swarovski. The best part? This was a DIY home manicure. So impressive! 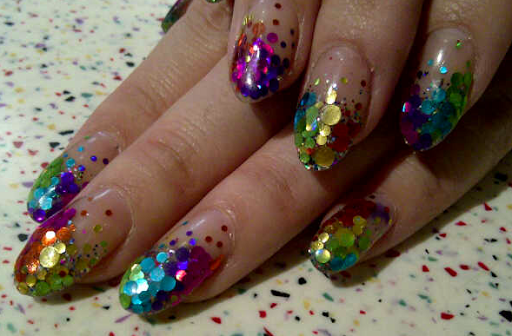 This rainbow-hued, glitter manicure by Naomi Yasuda would be perfect as birthday party nails. 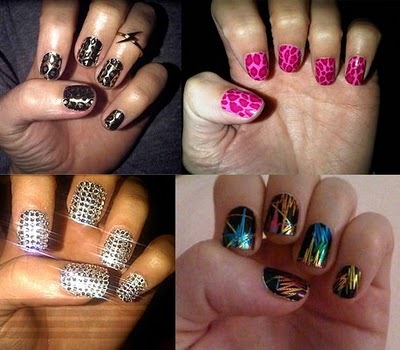 It’s an aggressive and complicated design, but could be re-created at home with a few fun glitter nail polishes (such as these or these). 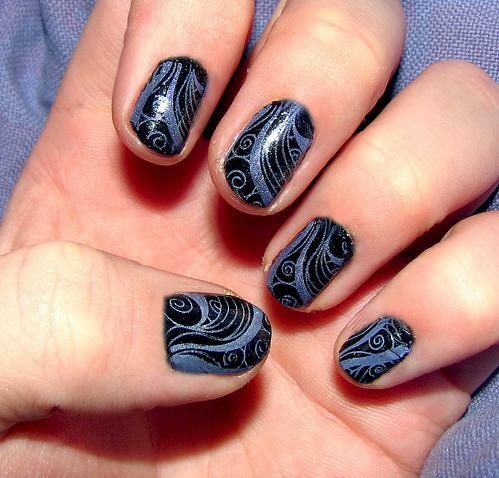 Glitter polish is nice worn on it’s own, or as a sheer layer over a complementary colour. ﻿For those of us not blessed with a steady hand, Konad nail stamps are probably the easiest way to create nail art at home. The stamps take a little practice to apply properly, but once you get the hang of it, you open yourself up to a world of exciting nail designs. In Toronto, you can buy Konad products at Wow Wow Nails. 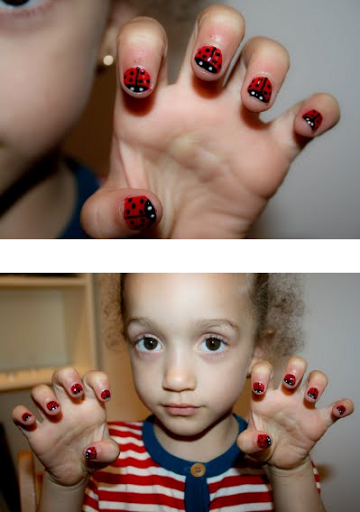 Finally, this ladybug manicure from London-based manicurist Emma is so adorable, but may be a bit complicated for the amateur nail artist. If your inner child is screaming for ladybug or watermelon-inspired tips, then get thee to Tips Nail Bar, where their talented staff can paint any design you can dream up.